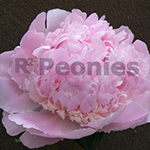 Angel Cheeks is one of the upcoming newcomer Peonies in the midseason. The large flowers from 15 cm in a striking pastel pink color with a narrow band of ivory petals near the flower base. Angel Cheeks is used a lot for cut flower crops as well for landscaping in gardens and city parks all over the world. Every year older the plant gives the plant more and more flowers.